Becoming increasingly popular, kelp noodles are a sea vegetable that is formulated with–you guessed it!–kelp, sodium alginate, and water. They are naturally gluten-free and vegan, and I’m pretty sure every bag I have seen says “gluten-free” right on the package. 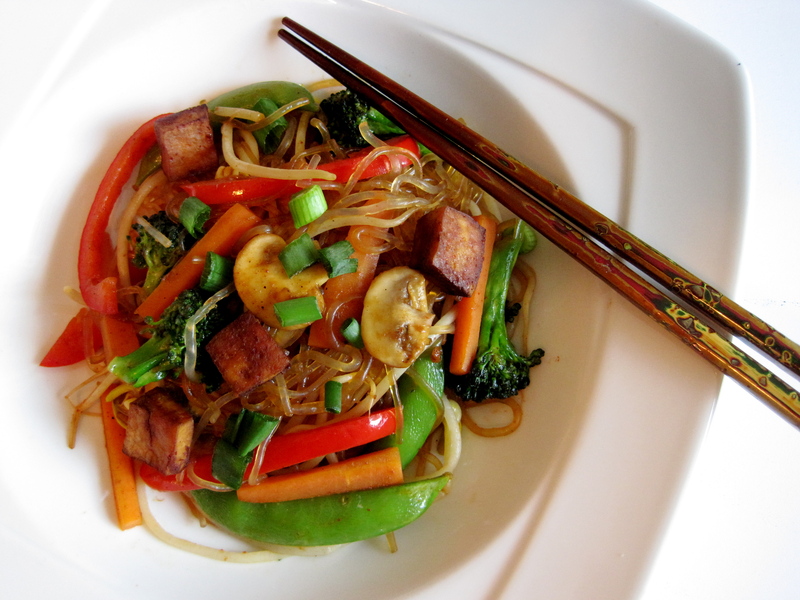 Kelp noodles stand in for grain-based noodles in this easy stir fry, excellent for those trying out a few meat-free meals. Baking the tofu brings on a meatier texture, and the sauce gives a nice balance of spicy/salty/sour/sweet. To make the tofu, mix together all of the ingredients. Let sit 30 minutes. Preheat the oven to 425F. Pour the mixture in a small baking dish. Bake for 30 minutes until the top of the tofu pieces are dry and brown. Flip each piece and bake for another 15 to 20 minutes until the other side is browned. Set aside. For the sauce, blend all ingredients until smooth. To make the stirfry, heat the oil on high heat in a skillet. Add the garlic and cook for 30 seconds until it starts to brown. Add the vegetables (except for bean sprouts), starting with crispier vegetables such as carrots and broccoli, adding vegetable broth as necessary to keep a bit of liquid in the pan. 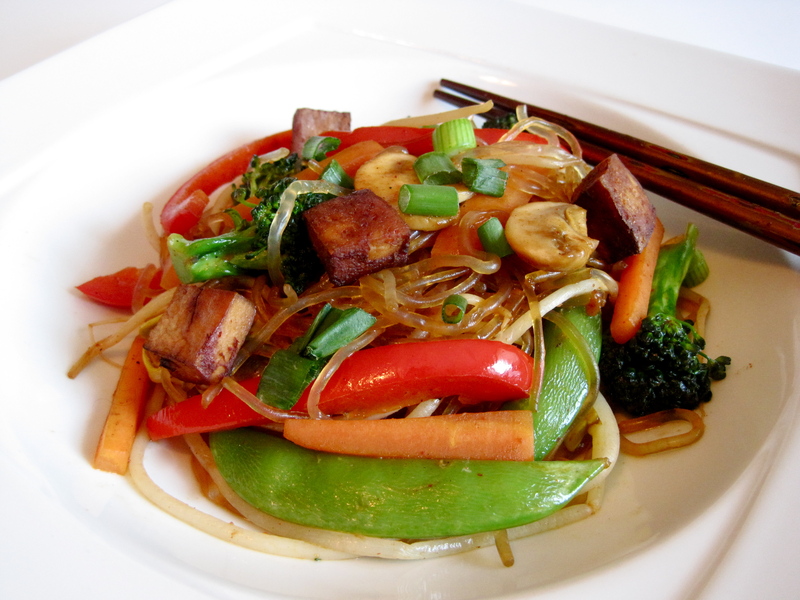 Once the vegetables are tender crisp, add the tofu, noodles, and bean sprouts. Add sauce, just enough to coat the ingredients. Turn to low heat and cook until the noodles are tender, about 4 minutes. Stir in the green onions. Serve immediately. Leftover sauce can keep covered and refrigerated for up to 1 week. They are gaining popularity so I wouldn’t doubt you’ll find them close by!